This cartoonish new video game is driving NYC teens looney tunes. The “Hunger Games”-style survival game — called “Fortnite: Battle Royale”— has already racked up a staggering 40 million players since it debuted in the fall, with 10 million joining in the first two weeks. But the viral game — which pits up to 100 players at a time against each other in a fight to the death — is eating away the lives of teenage gamers and driving their parents crazy. Benyacar’s mom, Michelle, thinks it’s turning her son into an addict. Though Michelle has instituted an electronic cutoff of 9:30 p.m., Harris confesses he’s attempted to pull an all-nighter. He and a pal played each other remotely, each in their own rooms until the other kid’s dad busted them a little after 2 a.m.
On weekends, “I’ll play the whole day. It goes by so fast — you can’t believe how long you’ve been playing,” says Harris, adding that he deleted all other games to conserve data for his No. 1 love. 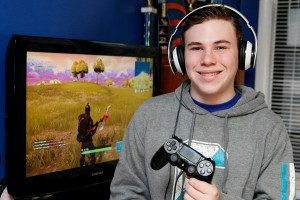 Dylan Reiner, 14, has no problem skipping dinner for a “Fortnite” fix. “Battle Royale” — an add-on to the original “Fortnite” made by Epic Games — is set in contemporary Earth, where players must scavenge for weapons, armor and resources in order to be the last player standing. Players wear headsets so they can talk with remote teammates and competitors until only one person (or team) is left alive and crowned a winner. Other desperate Big Apple parents are testing out various methods to get their kids unhooked. “I’ve hidden the remote controls and the headset a bunch of times,” says Upper East Side parent Lisa Spector. She says her 14-year-old son Dylan Reiner has become so obsessed, he won’t even stop to eat dinner. Spector’s tactic may be difficult to enforce in the future: This week, “Fortnite” launched a list where iOS users can sign up for invitations to eventually play on their phones, with an Android version to follow. 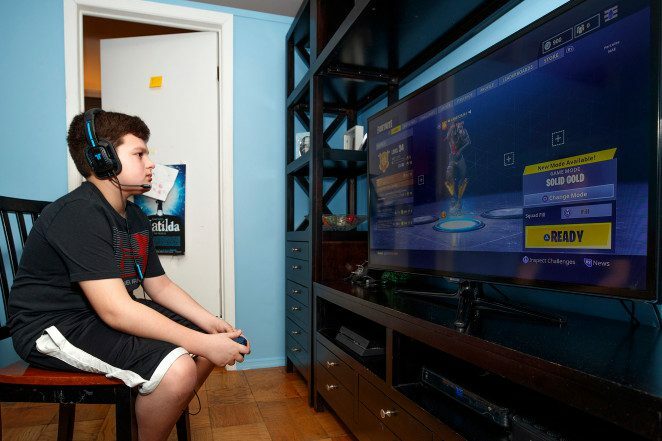 Upper West Side mom Lisa Graber says she’s resorted to bribing her three little “Fortnite” addicts to take a break. Even teachers have their work cut out for them, as students try to smuggle the game into the classroom. “People download it on [their] computers and play it during class,” says Adam Marek, 16, of Rye Brook, NY. Marek admitted to dreaming and hallucinating about the game. “Sometimes if I see something shining, I think it’s a [treasure] chest [from the game],” he says. For the most part, girls aren’t having it. But Harris’ 11-year-old sister, Dara, decided if you can’t beat ’em, join ’em. “You’re only cool if you play ‘Fortnite,’” she says. Benyacar indulges in “Fortnite” on his PlayStation 4.